VSEPR: Valence Shell Electron Pair Repulsion model uses the repulsion of electron pairs to determine strain on various bonds and the resulting electron ARRANGEMENT and GEOMETRY. It allows us to predict the shape of a molecule 3-dimensionally. Note: The difference between an arrangement and geometry is as follows. Arrangement is the general classification of “shape” but geometry is the specific “shape” of the molecule in question. For example: 3 sided figures: triangles (general shape) BUT 3 sided figure with equal sides: equilateral triangle (a specific kind of triangle). We count the TOTAL # of electron domains. Electron domains are pairs of electrons so we count both bonding pairs and non-bonding pairs to get the TOTAL. The total count will determine the arrangement. Then we look to see exactly how the total electron domains are distributed—meaning how many are bonding and how many are non-bonding (or lone pairs). Each particular combination will determine a geometry. 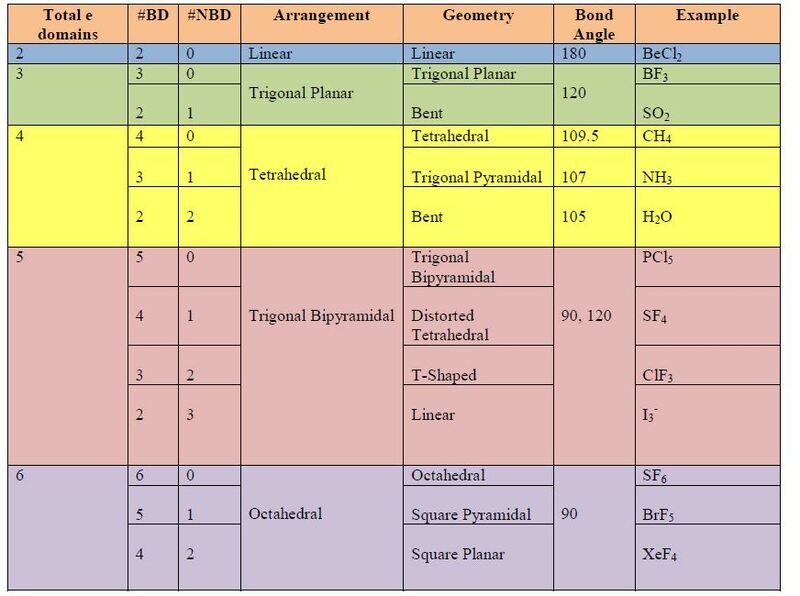 Count the TOTAL number of electron domains (both bonding and non-bonding) and classify the ARRANGMENT. Now within that arrangement, what is the specific combination and geometry. NOTE: the # of BD and NBD is from the perspective of the CENTRAL ATOM. So count only the # pairs around the central atom not in the entire compound! Double and triple bonds still count as 1 bonding domain (BD)! Example: H2O. When drawing the Lewis structure of water, oxygen is the central atom. 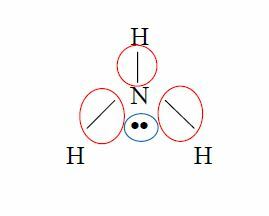 Therefore, it has two bonding pairs of electrons (to each H) and also has 2 pairs of lone pairs (pair of dots). So it has four pairs altogether, giving it a tetrahedral arrangement and bent geometry (2-2 combination of 2 BP and 2 NBP), which corresponds to a 105 degree bond angle.